Out of an interest in trying to understand the Chinese export porcelain trade by the Swedish East India Company (1731-1813), Jan-Erik Nilsson start researching the East Indiaman Gotheborg and the early Bourn, Lampa and Keiller salvage operations in the mid 19th to early 20th century. Data is found in the archive of the Museum of Maritime History in Gothenburg and in the collection of the Gothenburg Historical Museum. 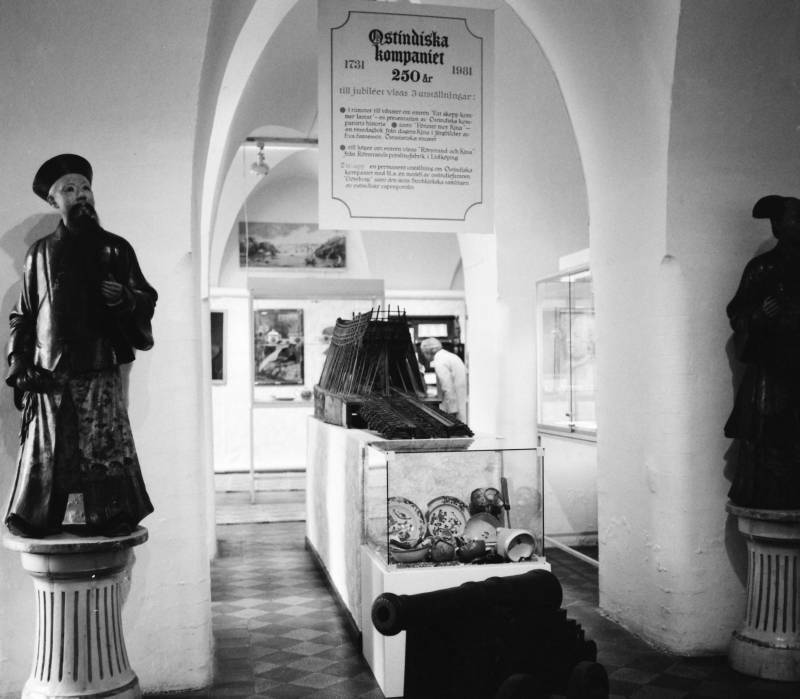 The sign also offers an exhibition of a model of the 'East Indiaman Gotheborg' and Chinese armorial porcelain from the Strokirk collection. Gothenburg Historical Museum celebrates 250 years anniversary of the founding of the Swedish East India Company (1731-1813). Anders and Berit Wästfelt have just arrived back home from Eilat and are setting up Marinarkeologiska Sällskapet, Göteborgskretsen (MASG). Anders start looking around for an interesting enough wreck site that could be used for teaching marine archaeological competence and diving skills. December 1984. Anders Wästfelt brings three diving friends to Hunnebådan in search of any remnants of the wreck of the original foundered East Indiaman Gotheborg. They are successful. Jan-Erik Nilsson and Anders Wästfelt meet and can confirm 'beyond any doubt' that Anders and his friends have indeed found the 1745 year wreck site of the East Indiaman Gotheborg. At the bottom Anders Wästfelt and his friends found an area large as several foot ball fields completely strewn over with porcelain shards and all kinds of wooden artefacts. It was no doubt that this was the wreck site, but there were no trace of the hull. What had happened? 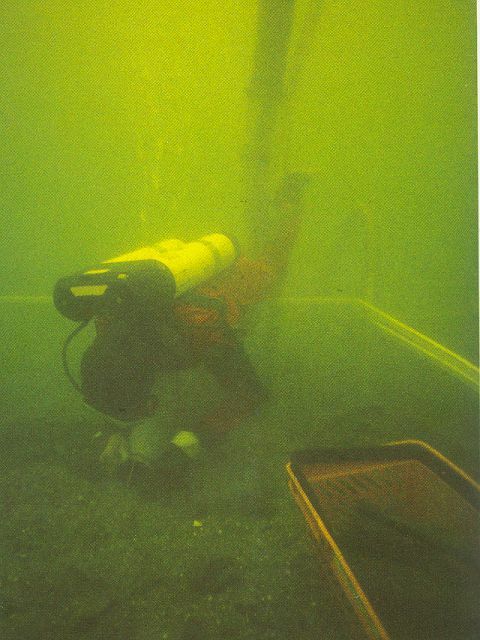 The underwater excavation which was followed via extensive publicity, thousands of lectures and a large number of international exhibitions went on during 1986-1992 and created the goodwill and public interest that would fuel the project. 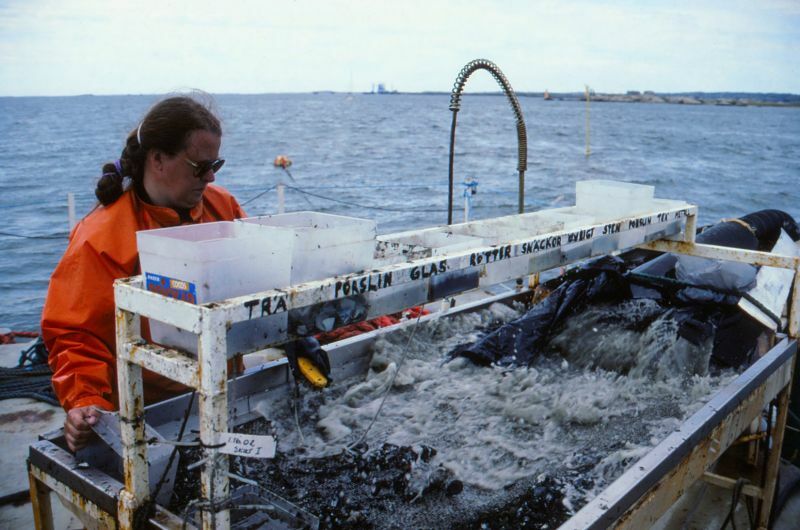 The Wästfelt excavation of the Gotheborg is commenced with its first diving season. Knowledge of the main proportions, the rig, the armaments, and other details of the ship is starting to be collected. Two first test trenches are dug. Large amounts of Chinese porcelain shards, remnants of broken tea crates, larger ship's construction parts are found. 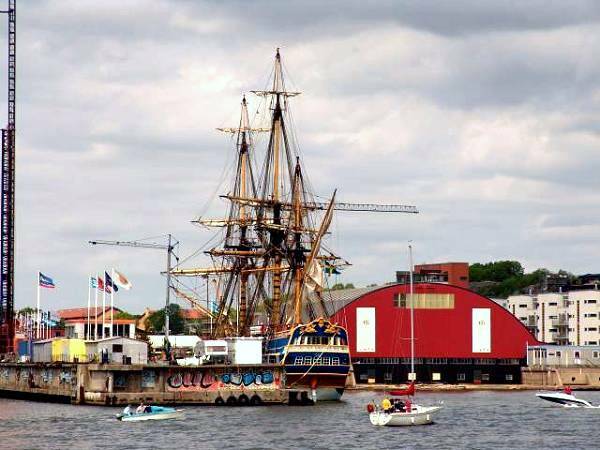 The Friends of the East Indiaman Götheborg Organization is established in February to support the excavation project. Erik Wettergren becomes its first Chairman. During the excavation the first complete and unbroken porcelain items are found. Different types of ammunition is also found together with personal belongings from the crew. Complete sides of tea crates are found. During the excavation period innumerable events and lectures was held to popularize the excavation of the East Indiaman and its results. Details from the ships stern are identified. 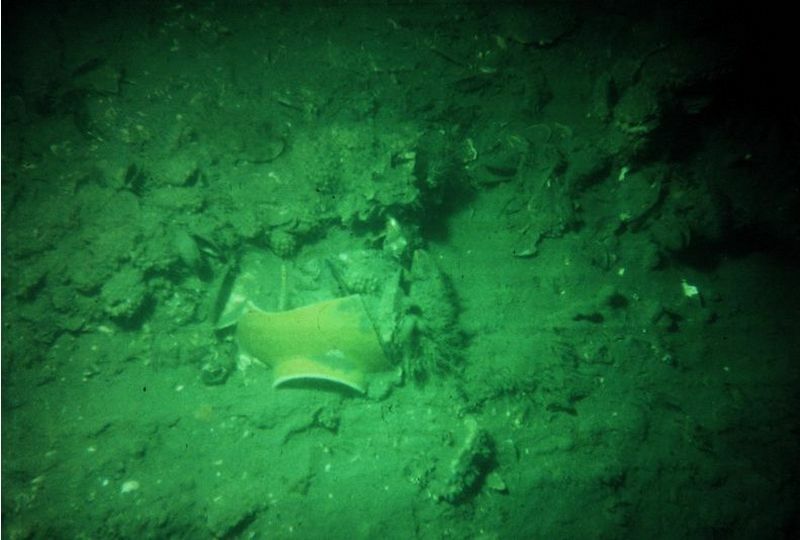 The first complete bundle of intact porcelain plates are found which gives a first clue about what the the bundles listed in the cargo list could have looked like. Two large sections of the ships aft are lifted up. The original location of the wreck is found and decided with certainty. The fact that the ship in its construction had been inspired by the British could be noticed by the fact that the ship had been equipped with an extra 'loose' keel, to improve its sailing ability. One of the 6,056 bars of 'Tutanego' the ship had originally carried from China. It could finally be confirmed that this elusive metal was nothing but plain zinc. One of the 6,056 bars of 'Tutanego' the ship had originally carried from China was found. The total weight could be decided to 21.6 kg which with a high degree of certainty could confirm that the Bill of Lading was correctly listing c. 130 tons. Last season of actual excavations. The area close to the ship is investigated. The entire excavation area is covered with gravel to indicate for future investigations which area has been disturbed. Finds that could not be preserved are put back and filled over. 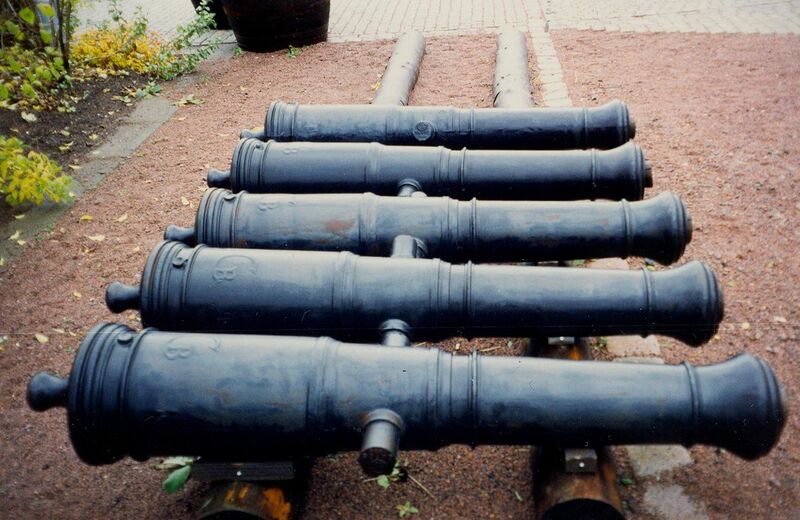 Remaining excavation equipment was taken up and put in storage at New Elfsborg Fortress. 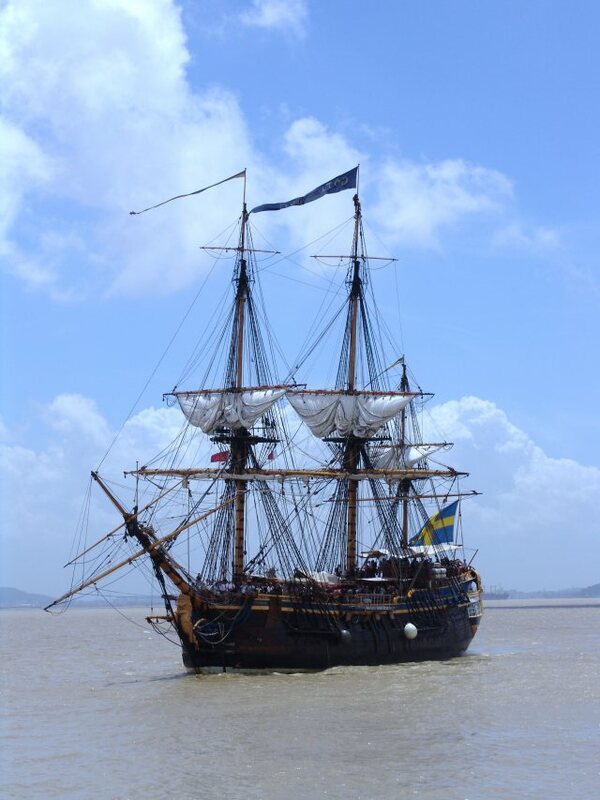 All lectures are now finalized with the words - and now we are going to build a replica of the East Indiaman Gotheborg, and sail with her to China and back, again. But this time, we are going to make it all the way back into the harbour, and not hit Hunnebådan and sink again, alternatively - and start the trade again and all become very rich. A whole series of international exhibitions are undertaken to promote the finds, the ship and the forthcoming continuation. In 1992 the finds from the excavation are exhibited at the historical Museum of Shanghai. A 44 meter long banner down the facade is advertising the exhibition that eventually attracts almost 30,000 visitors. At this moment the exhibition is all but ready to open and we goes out to see the banner being hoisted. Anders Wästfelt, to the right. 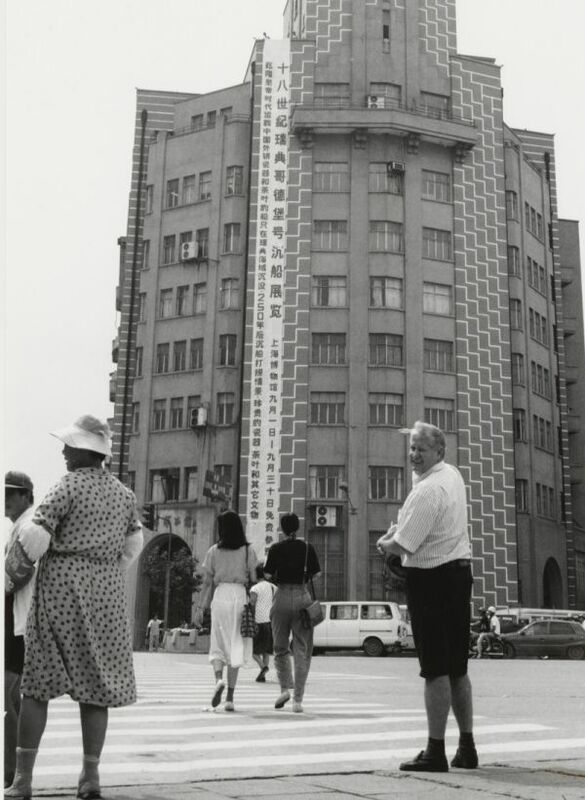 Photo: Jan-Erik Nilsson, Shanghai, 1992. The East Indiaman Gothenburg is exhibited in Shanghai, organized by Anders Wästfelt and the Swedish Consul General Bengt Johansson, in Shanghai. The exhibition is much published in Chinese media and is visited by large Swedish delegations, mostly from with Swedish companies already established in Shanghai. The first logotype for the Ship Building part of the project is drawn by Jan-Erik Nilsson, based on the cover of the original 'Ledger A' of the Swedish East India Company, preserved in the Regional Archive in Gothenburg, where some of the documents from the first periods of the Swedish East India Company 1731-1813 are kept. In 2003, this logotype was eventually reproduced on stamps issued by the Swedish Post commemorating "Ostindiefararen". This logotype was later replaced with one supplied by Forsman & Bodenfors, that included a sailing ship. 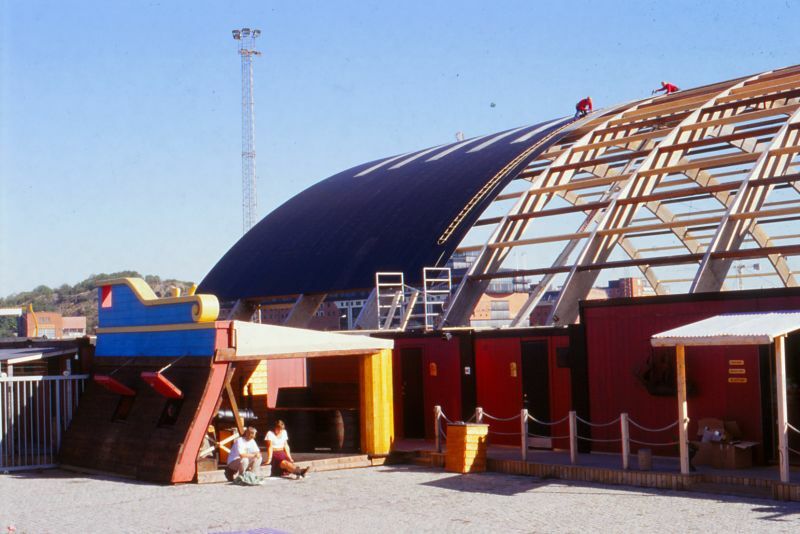 In October 1992 the idea of building a replica is presented by Anders Wästfelt to the Friends of the Gotheborg Organization. The 'Friends' fully embraces the vision. Money is advanced towards the funding of a feasibility plan for the new project. An organizing committee is brought together to make the project a reality. Berit Wästfelt has the last say in who is going to be in or out. The original members came to be Anders Wästfelt - the sole individual initiator - as (Information and Marketing) and his wife, Berit Wästfelt for (Recruitment and Staff Administration). In the committee is also Erik Wettergren (Chairman) and later first CEO, Lena von Sydow (Economy). Jan-Erik Nilsson (Research and Documentation, later also IT), Erik Pipping (Historical Rigging), Eric Lincoln (Nautical Engineering) and Joakim Severinsson (Ship's Construction). Soon several more people are added to this first committee that eventually, together with Bo Alfredsson, second CEO after Erik Wettergren, becomes the Management Group who are also the only ones doing any real management of the project until the hull is well under way to be built, in mid 1997. 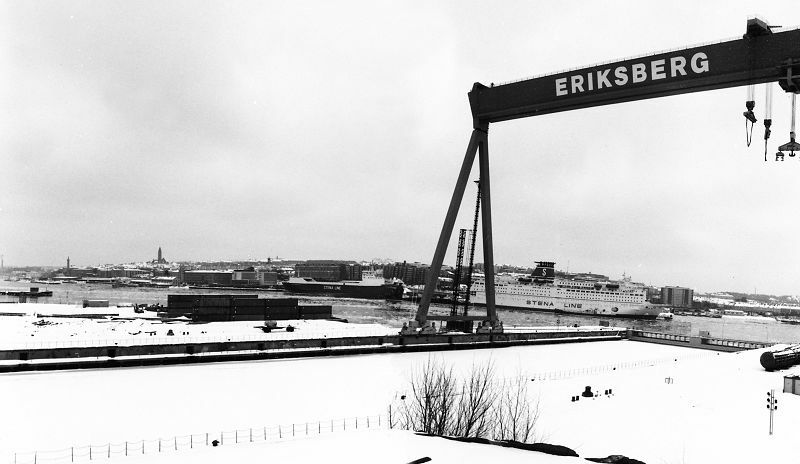 The old Eriksberg shipyard where we would build our own 'Terra Nova'. It is the first winter of the project and the year is 1992 to 1993. Never, I though when I took this picture, will the East Indiaman Gotheborg feel further away than this. In my minds eye, I could already see the wooden ribs of the hull sticking up against the snow gray sky down there, near the black row of containers, left there from a theater project. I also remember that I had no doubt at all about the we could do it. Personally I thought finding a place near water to build the shipyard would be the most difficult part of the whole thing. Now there were just a few practical details to sort out. We in the early core organizing committee have started to have our meetings in an old house called Skateberg, at Lindholmen. We have just decided to have regular meetings to get things going and to report what each of us have done since the last time. This routine gives a framework to the project even if we lack pretty much everything. Mostly it is Anders who is still traveling around and lecture to groups of people and sponsors. Today Anders had interesting news. He had met with Bengt Tengroth, who at this time is heading Eriksbergs Utvecklings AB and from him managed to secure the rights to use a piece of land at the old Eriksbergs shipyard area. They plan to eventually use the land to build something, but in the meantime we are welcome to build our ship on it. Terra Nova Shipyard, summer of 1993. Here we would build the shipyard. We were firmly determined that on this muddy piece of industrial wasteland we would build a ship that would sail to China. But, first we needed a shipyard. 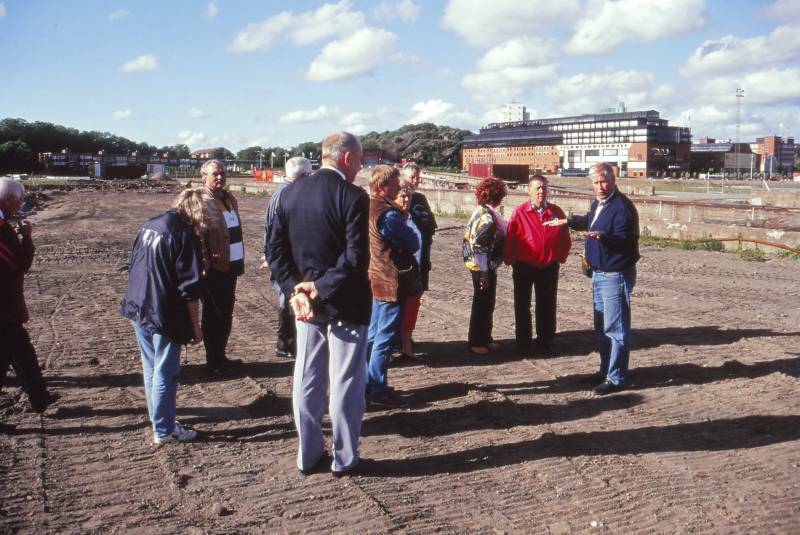 To the right, Anders Wästfelt describing the layout of the shipyard. September 12 1993, public announcement towards an information's meeting at Hotel 11. Official start of the project. 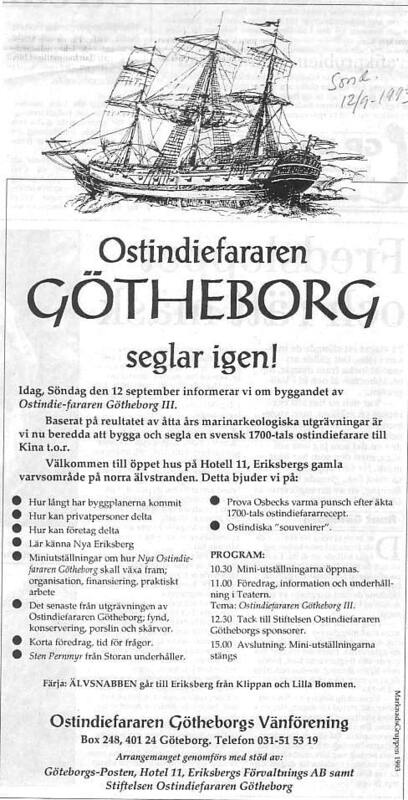 Advertisement design: Jan-Erik Nilsson, Sept 1993. November 5, 1993. The Management Group sets out to organize the East Indiaman Götheborg III Foundation to assume the overall responsibility for the project and to become the beneficiary of the donations that will be needed to fund the project. More than 40 friends and sponsors are invited to become Founding Fathers to resume the sole responsibility to oversee the activities of the foundation and to that end to have the right to select the members of the Board of Directors of the Foundation, at a yearly meeting. December 28, 1993. The Management Group asks the Friends to donate the funds necessary for the Foundation to register the The Swedish East India Company AB as a fully owned company, to build the ship. The Friends donates 100 percent of the shares of the SOIC AB, to the Foundation. All in all the Friends were able to donate close to 200,000 SEK during 1993 to get the project started, including the money needed to create the Swedish East India Company, SOIC AB. 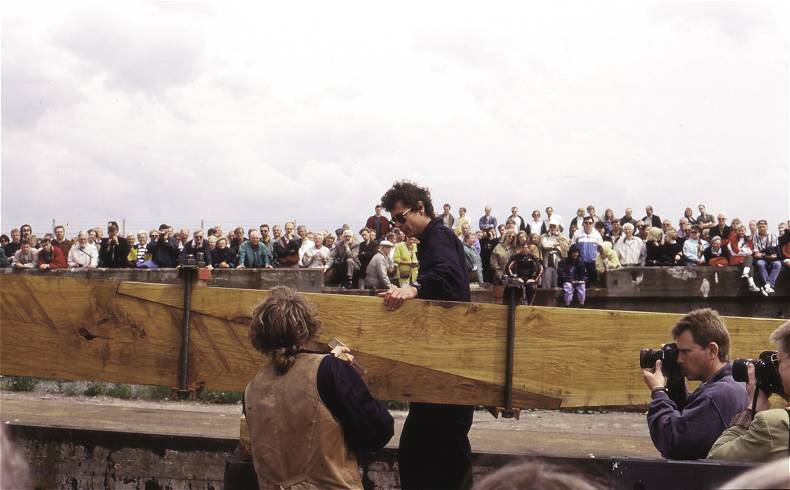 In 1994 the members of the Friends Organization together with hundreds of voluntary workers and supporting companies starts the building of the new shipyard Terra Nova at Eriksberg. The General Hull and Rigging plan Hull is drafted. The hull is drawn by Joakim Severinsson, The rigging by Olof Pipping. 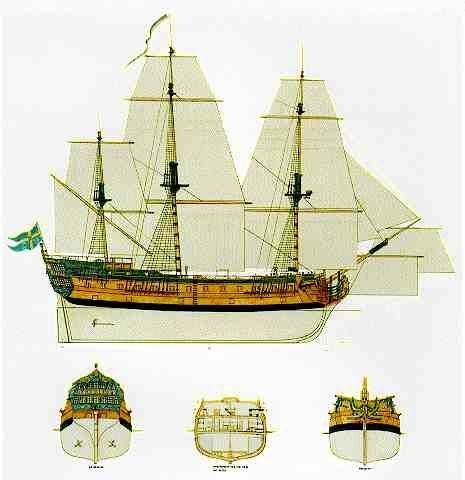 The fore and aft ship decoration drawing by Roland Rydén. It was decided that the ship would have a hull of wood, about 75% oak and 25% pine. In order to provide enough strength, the frame-timbers would be made from laminated pine. 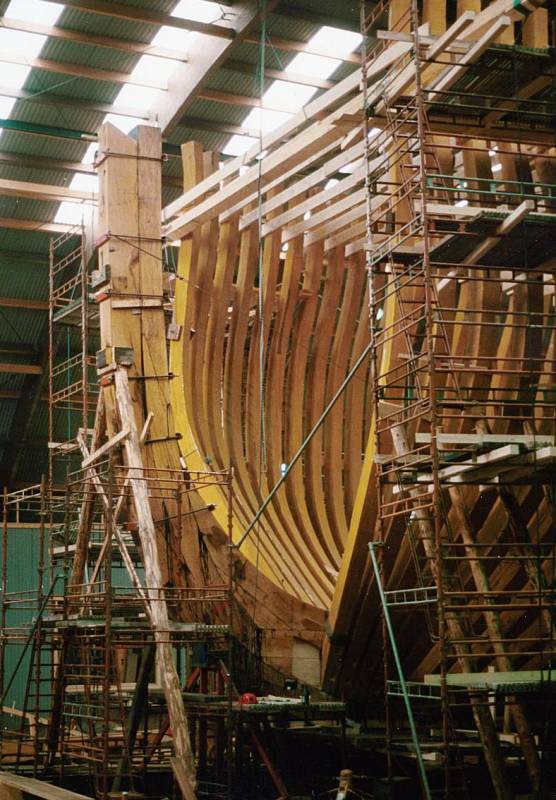 The keel, stem, stern, beams, planks, trimmings and other framework details would be made from oak. The decks would be of pine. The sails and the standing and running rigging should be made with traditional materials, mainly hemp. The hull would be constructed with as much historical accuracy as possible outboard as well as inboard above the free board deck. The hull would be divided into six waterproof sections for safety and in order to limit any possible damage. Beneath the free board deck, no consideration of historical tradition would need to be taken, but the design and materials used would still be in keeping. The deck machinery would be as historically correct as possible. The ship was to be ballasted to obtain the historically correct waterline and carry 80 persons in crew, officers and trainees, and 12 passengers. 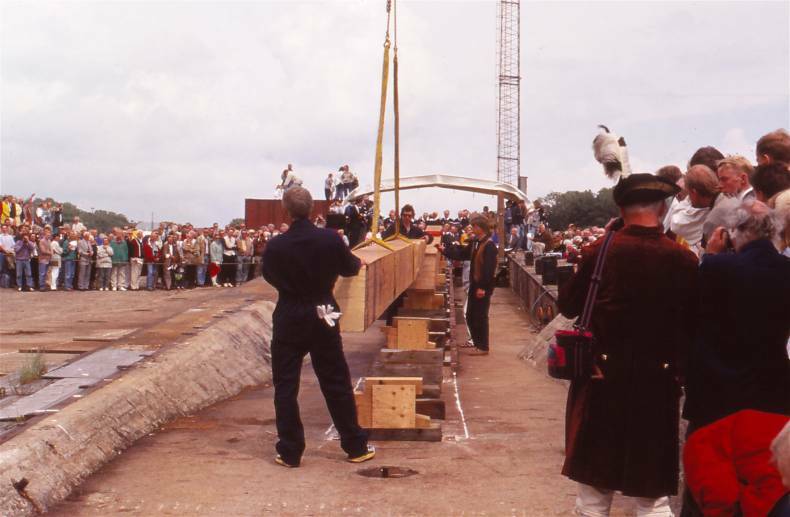 June 11, 1995 the official laying of the keel takes place in front of 3.000 spectators. The ceremony is performed by Sören Gyll, Volvo AB, Professor of History Jörgen Weibull and Alf Österström, Priest of the local congregation. 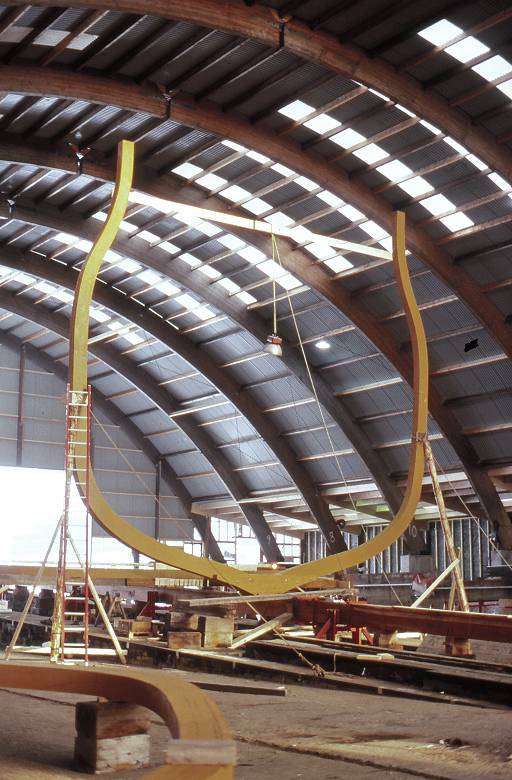 Two coins are placed in each of the two joints of the 33 meters long oak keel. Three years later the Friends Organization, the Management Group and a huge numbers of volunteers, brilliant ships builders and carpenters can proudly show they are well on their way doing the impossible. 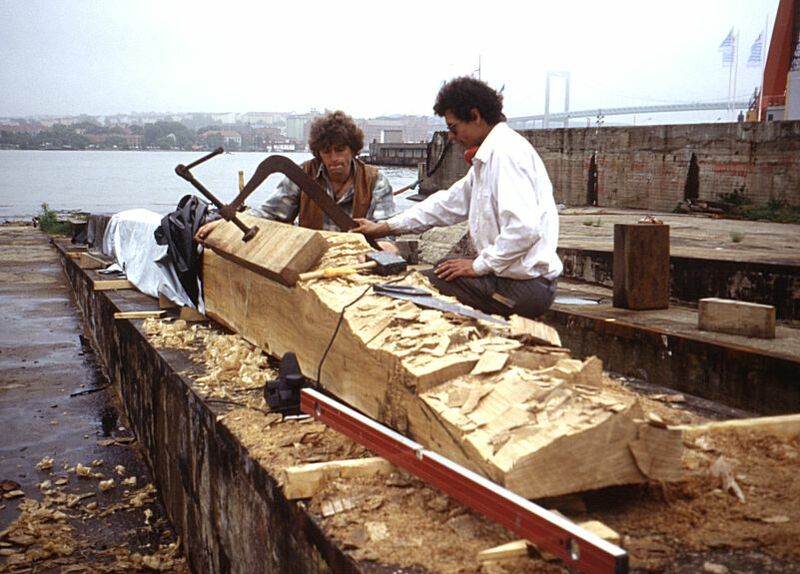 The keel of the ship consists of three separate parts made out of the best possible straight grown oaks. Here one of the joints - lask - is prepared. The keel have two of these joints. In each of these a coin was placed for good luck, each respectively representing the history, upon which our now and future, is built. 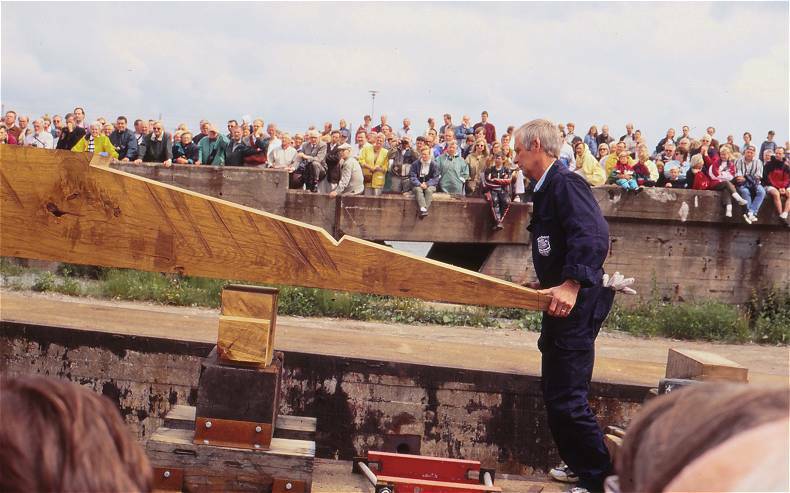 In 11 June 1995 the keel that was made of three large sections of oak was officially laid out and joined. This was made ahead of time, before the ships hall was erected. for good luck, and to represent the history. 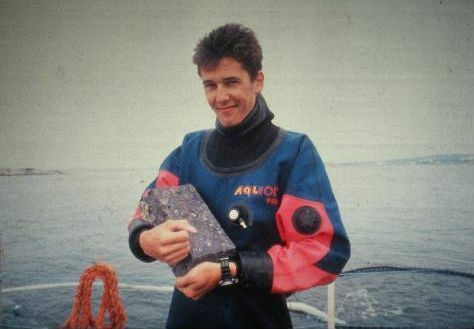 Photo: Jan-Erik Nilsson, 1995. 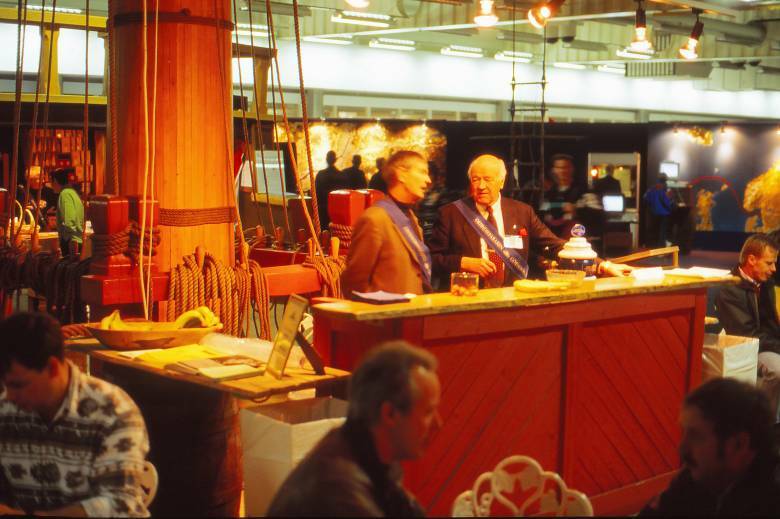 In 1996 the shipyard hall is built. Wood beams from an old building elsewhere are found that will fit our purpose perfectly are found and a light tin roof is built across the beams. On each side of the old slip way there were eleven plinths cast in reinforced concrete to support large beams that are to form the roof over the ships hall. The beams came from an old building in Skandiahamnen and was donated to us by the Gothenburg Harbour AB. The covering of the hall with a light tin roof, we eventually needed to contract and pay for, but the rest was sponsored. It could not have become better or more fitting even if we would have had the building especially designed for our purpose. 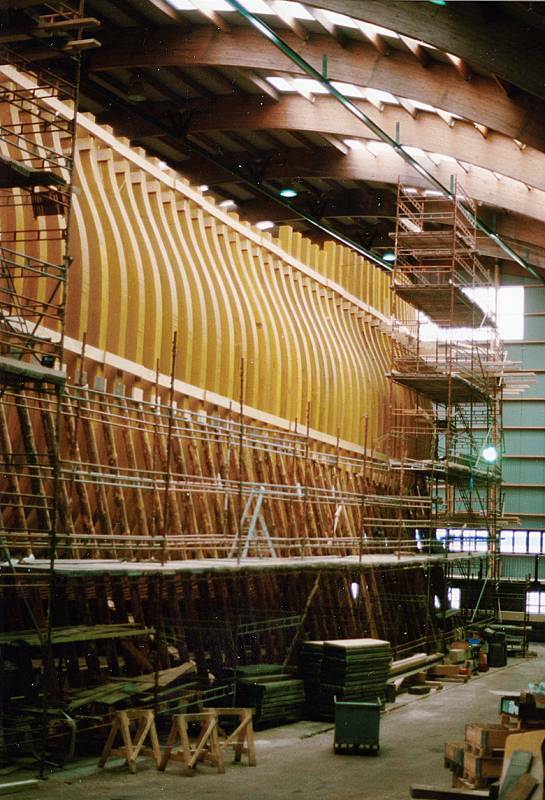 In 1996 the shipyard hall that will cover the hull is raised and covered with a roof. To the left is a scale model of a section of the canon deck, to give visitors an idea of the proportions of the Gotheborg, with the guide Karin Mojzis. To the right, the first Terra Nova 'souvenir shop'. They wanted to help, but would soon relocate to a new factory where this kind of castings would not be possible any more so the canons arrived to the shipyard even before the first rib was raised. 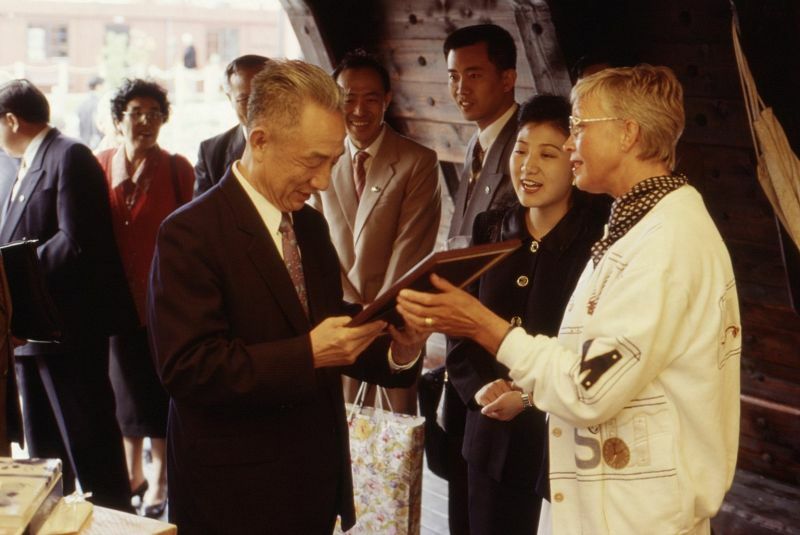 The 4th of June 1996, Terra Nova is visited by the Vice Premier of China, Mr. Zou Jiahua ho is given the Ticket no 1 for the last leg to China with the East Indiaman Gotheborg III, "as soon as we have built her". 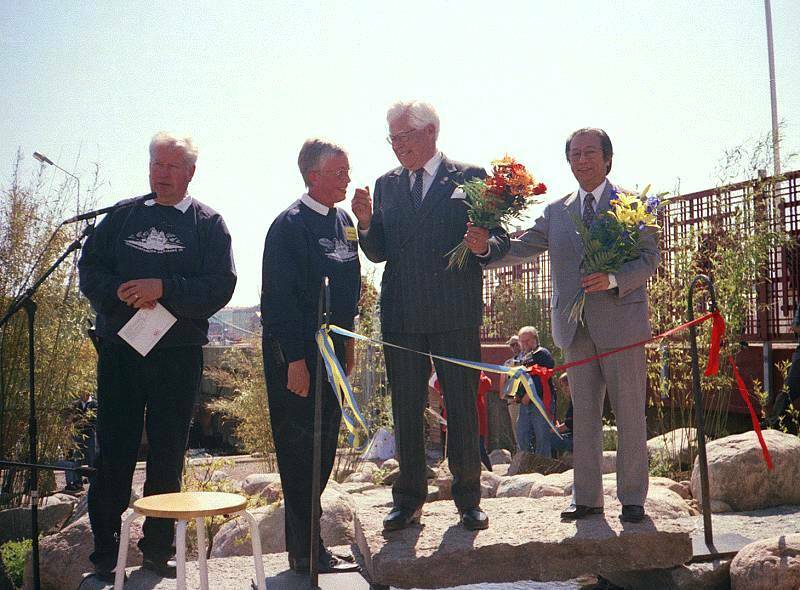 The 4th of June 1996 The shipyard is visited by the Vice Premier of China, Mr. Zou Jiahua together with the Chinese Ambassador to China, Mr. Yang Guirong and the Swedish Ambassaor to China, Mr. Sven G. Linder. Later the same year the Major of Shanghai, Mr. Xu Kuangdi visits the Shipyard. The 8th of December 1996, the first rib is officially raised. 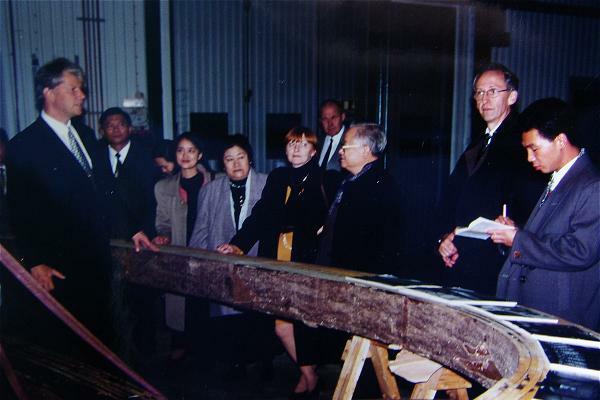 Jan-Erik Nilsson (left) presents the rib manufacturing process to the Major of Shanghai, Xu Kuangdi with entourage. To the far right, Nils Olof Ericsson, official interpreter to the Swedish Ministry of Foreign Affairs. Anders and I are extensively interviewed about the purpose, plans and progress of our project ahead of the then Swedish Prime Minister Göran Persson's visit to China the on 2-4 November 1996. We are now convinced that would finally receive some kind of public recognition and ideally some kind of financial support, but, no. 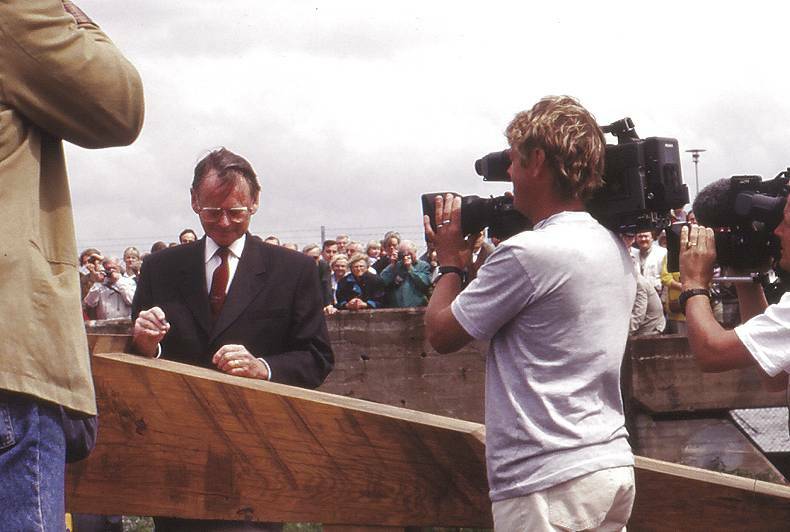 The 8 December 1996 the first rib is erected. A much looked forward event is held inviting anybody interested via advertisements in GP, organized and run entirely with volunteers, mostly from the 'Friends' organization. Around fifty persons are helping with reception, serving and guiding of about 3,000 guests. First East Indiaman Gotheborg IT fair occupying 1500 square meter area - the entire G Hall - at the annual Boats Show at Svenska Mässan. Nils Boijart, Jan-Erik Nilsson and Anders Wästfelt creates a 'Virtual World Tour' focused on the trade route and the cultural and commercial purpose of the project. The whole world participates via Internet and interactive webcams. Ahead of opening day, programmer to the project, David Nilsson, studies the "North Sea Destination" on one of the Virtual Tour monitors, sponsored by Siemens, connected to a state of the art network at Svenska Mässans G-Hall, Gothenburg. The youngest generation immediately understands the connection between old and modern world traveling. At this fair we pioneer World Trade Portals at the Internet. 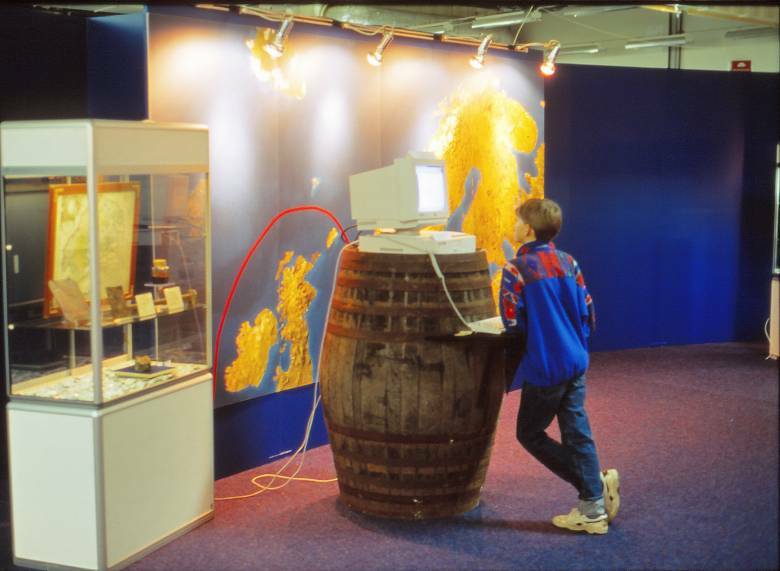 Photo: Jan-Erik Nilsson, February 1997.
while the old timer enjoys the smell of tar in our inside out globe shaped exhibition. Minister of Trade Leif Pagrotski visit Shanghai and the Gotheborg project web pages at gotheborg3.se are a sensation. They are the first web pages in the world produced in the west with information directed to China - in Chinese. The pages are shown to 15-20 millions of viewers in Shanghai TV. Lars Åke Skager can at a meeting with Governor Göran Bengtsson in Gothenburg tell the Swedish Ambassadör Sven G Linder and a number of western Swedish managers that the Swedish delegation the next day received an astonishing reception by the Major of Shanghai, as he saw it, thanks to our web pages. On May 22 the Chinese Garden at Terra Nova was inaugurated. A large number of members of STAF had contributed the work. The inauguration was done by a unique ceremony where the 'Friends' Chairman Erik Wettergren, tided together a Swedish silk ribbon with a Chinese. From the left Anders Wästfelt, Berit Wästfelt, Erik Wettergren and the Chinese Consul General in Gothenburg Tan Jianlun. 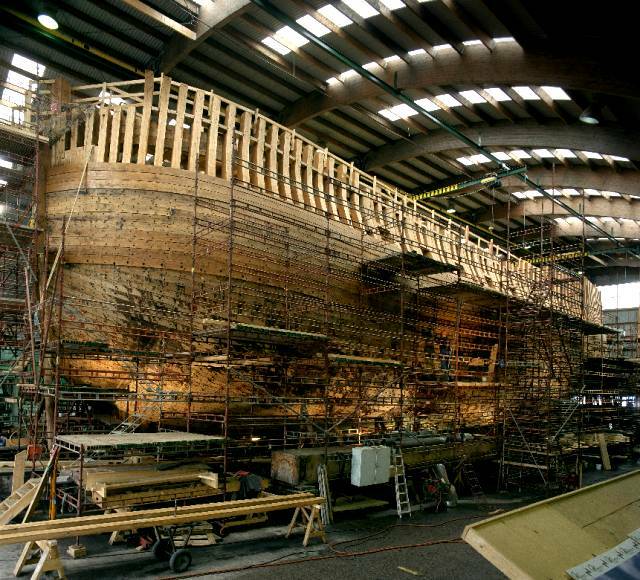 During the year 1997 the ships ribs are made and erected one by one. The 12 November 1998 the 66th and last rib was raised. Photo: Jan-Erik Nilsson, 1998. The 12th of November 1998 the 66th and last rib is raised. The ship's main inner structure is now finally complete. From now on the the organization changes focus onto the ship building only. The project initiators find themselves not needed or actually not wanted any more. Since we were never hired or paid by anyone to do this, there are also no traditional ways of 'managing' us who in realty were running the entire project. We find that we have created a level of management higher then ourself, who now finally want to take over - SOIC AB and the Gotheborg III Foundation and thus as it turns out, in effect also given away the ship. Since almost all sponsors are there to support the larger purpose of the project as originally visualized by the initiators, the project now gets delayed for a few years. On the 1st of January 1999, Jörgen Gabrielson was appointed Managing Director of the Swedish East India Company, SOIC AB. With the ship the work inside the hull is started. Making and fitting of deck's beams are completed. Adding planking to the hull is started. Work with making parts to the rig is started. Work with sculpted wood decorations and the figurehead is started. Actual making of the sails is started. Ship's hull in the main shipyard hall at Terra Nova, Gothenburg. Larboard (port) side of the ship, from Galleon and fore, looking aft. 8th of August, 2002. May 7th, 2002. The two TAMD 165 A 386KW (525HK) Volvo engines promised to the project in 1995, was delivered. Entire hull's planking is complete. November 2002, two propellers especially made for the ship, arrives. 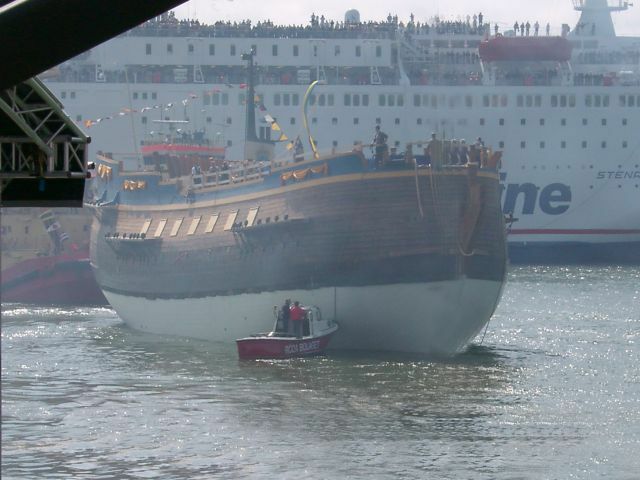 The 6th of June 2003 The Gotheborg III is launched from our Terra Nova shipyard. Swept in the white smoke of gunpowder the salute is booming across the Gota Älv River again. 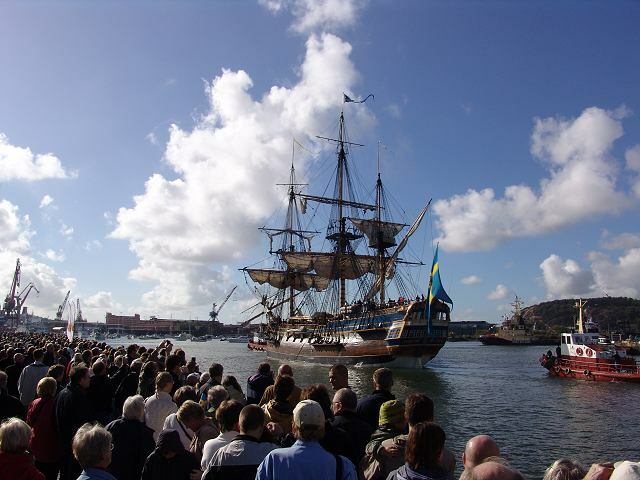 June 6, 2003 The East Indiaman Gotheborg III is launched in the presence of the Swedish Royal Family and the media attention is intense. One week later at June 13th the first mast was fitted, which were the 23 meter long foremast. Work continues at quay side. September 3, 2004. Her Majesty the Queen Silvia performed the naming ceremony of the Swedish East Indiaman Götheborg at the Opera House at Lilla Bommen. 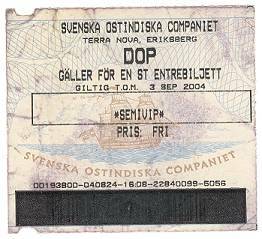 Ticket to the naming ceremony of the Gotheborg III ship. February 2005, Volvo enters the project as an official partner. and grew over a period of years between 1993 to 2005 to a popular tourist attraction. Photo: Jan-Erik Nilsson, May 29th 2005. April 18, 2005, The first trial voyage ever with the new built ship. May, Saturday 21 - Sunday 22, 2005, First trial voyage ever under sail. At most eight sails were up giving the ship a top speed of 6 knots. The 2nd of October 2005 The Gotheborg III departs from the inner harbor pier in Gothenbourg followed by the cheers of tens of thousands of spectators. The white smoke of gunpowder and the thunder claps of the salute is booming across the Göta Älv River once again. Finally, departure for China. 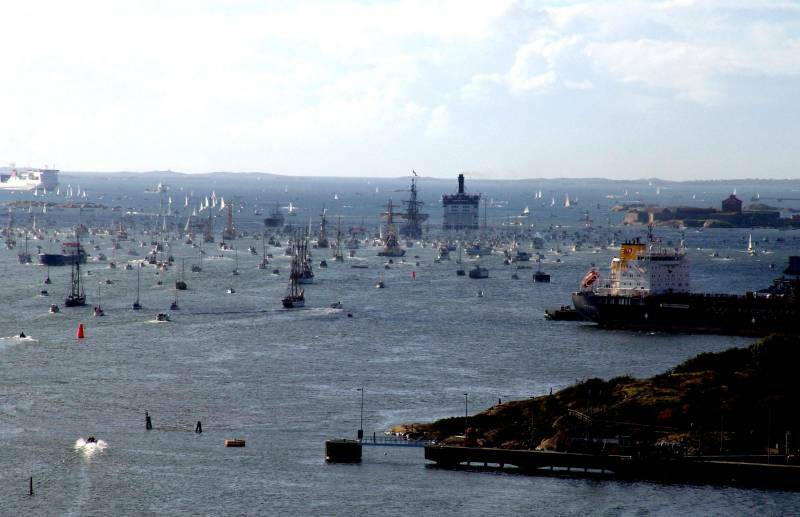 Thousands of large and small boats follows our East Indiaman while leaving the Gothenburg Harbor. In a few minutes she will be passing pretty much over the spot where her predecessor sank 260 years ago, in 1745. Elfsborgs castle and excavation head quarter to the right of the huge passenger ferry. Photo © Jan-Erik Nilsson, 2005.
with the old 'Bocca Tigris' just a few miles up the river, in clear view from where I stood. The 18 July 2006 the Gotheborg III arrives to Bocca Tigris in the Pearl River delta after twenty days of sailing from the former Batavia, nowadays Jakarta more or less exactly 200 years after the last Swedish East Indiaman having left China. 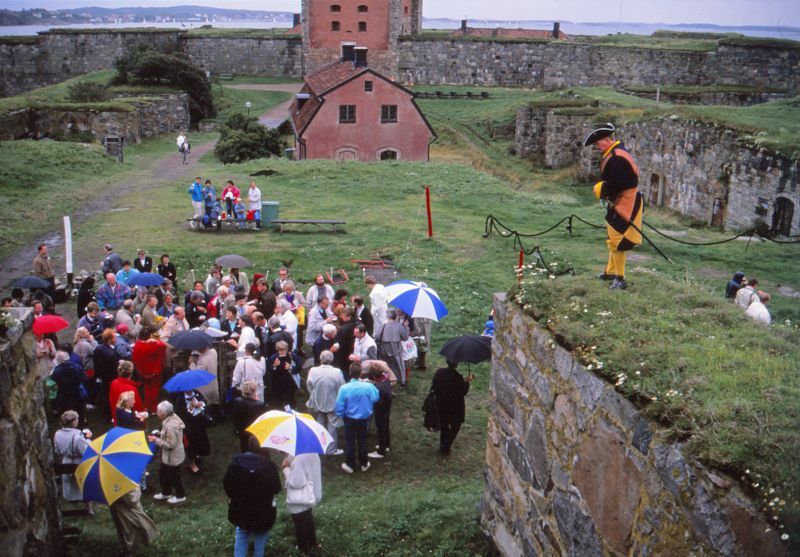 The reception was amazingly generous to the Swedish East Indiaman. After having lowered the masts to be able to continue the trip upwards the Pearl River under low hanging cables and bridges, the Gotheborg III continued up the river to its historical goal of the journey the city of Guangzhou (Canton). The first of its kind ever, to reach the actual city. 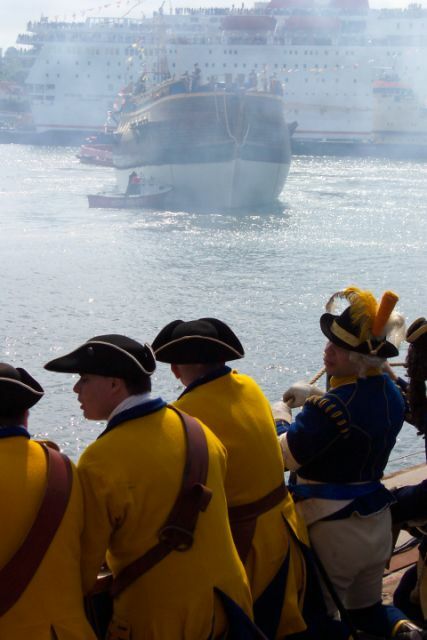 Chinese President Hu Jintao and Swedish King Carl Gustaf VI disembarking the East Indiaman Gotheborg after homecoming to Gothenburg the 8 June 2007. 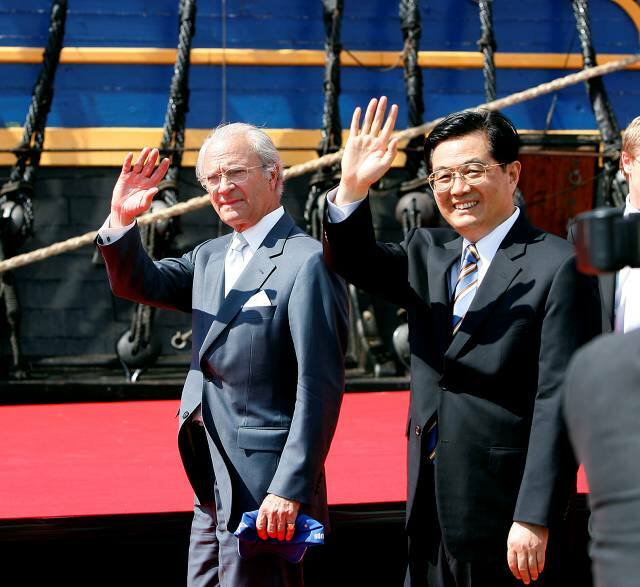 On 8-10 June 2007 the Chinese President Hu Jintao isits Gothenburg and participate in welcoming the Gotheborg III back home after the voyage to China. This is the first official visit to Sweden ever from China, and includes an audience with the King and meetings with Prime Minister Fredrik Reinfeldt and other cabinet ministers as well as representatives from the Swedish business community.